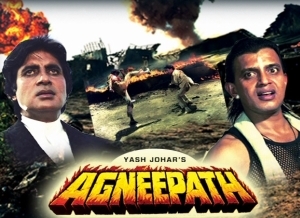 Agneepath produced by Yash Johar and directed by Mukul S. Anand is a National Award-winning Hindi film.Bachchan and Chakraborty received the National Award for Best Actor and Filmfare Best Supporting Actor Award respectively for their performances.It has earned Rs. 17,24,91,040, equivalent to US$ 4 million, after adjusting for inflation.The title was taken from a poem penned by Harivansh Rai Bachchan, Amitabh’s father, and which is recited by the main character throughout the film. Take the path of fire…. then you shall not falter…not tire…and achieve your goal…. is what Master Dinanath taught his son Vijay.Vijay Dinanath Chavan’s father is implicated in a scandal and lynched by the villagers on the instigation of Kancha Cheena.Vijay, at a young age, takes on the responsibility of looking after his mother, and sister and in the process, he becomes a gangster Vijay swore that one day he will give the village to his mother. The path of fire did Vijay take.From a shoeshine boy he became a dreaded gangster called ‘Bhai’…Saved twice by a coconut vendor, Krishnan Iyer M.A…. Vijay put him up to protect his sister who was studying outside the city… and his mother who did not see eye to eye with Vijay on his quest to be number one of the under-world.Reach the goal… Vijay did – he was invited by Kancha Cheena to Mauritius .